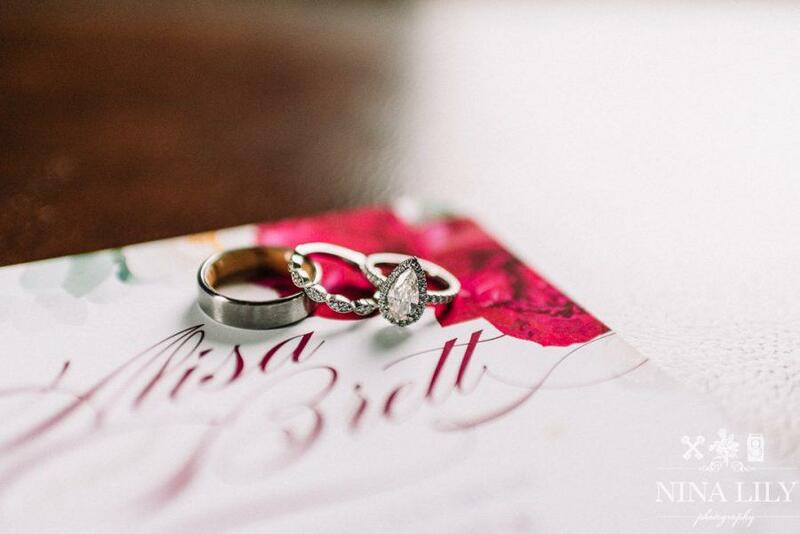 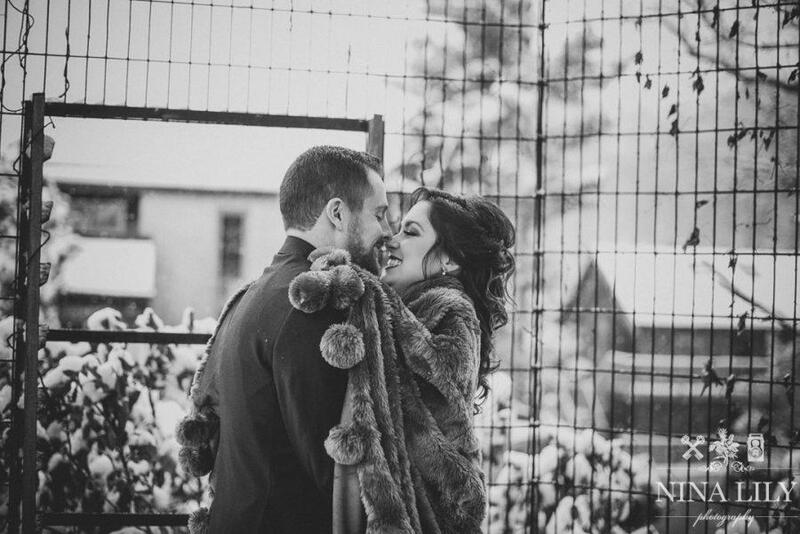 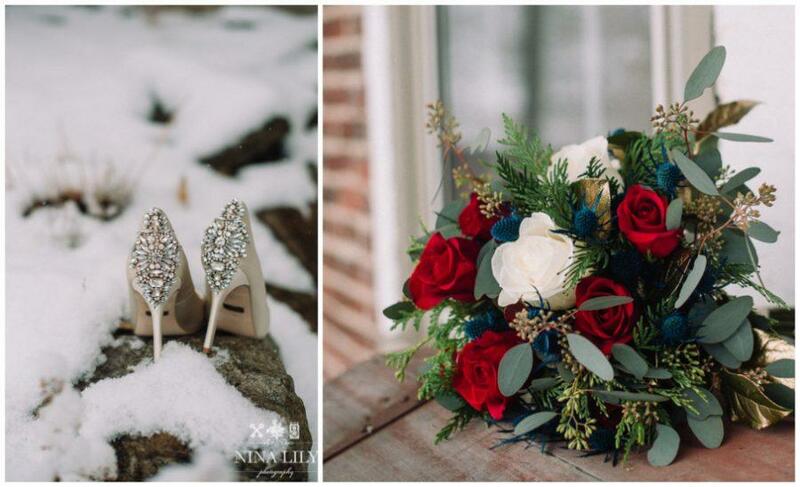 Elegance and picturesque details combined for this couple’s wintry day! 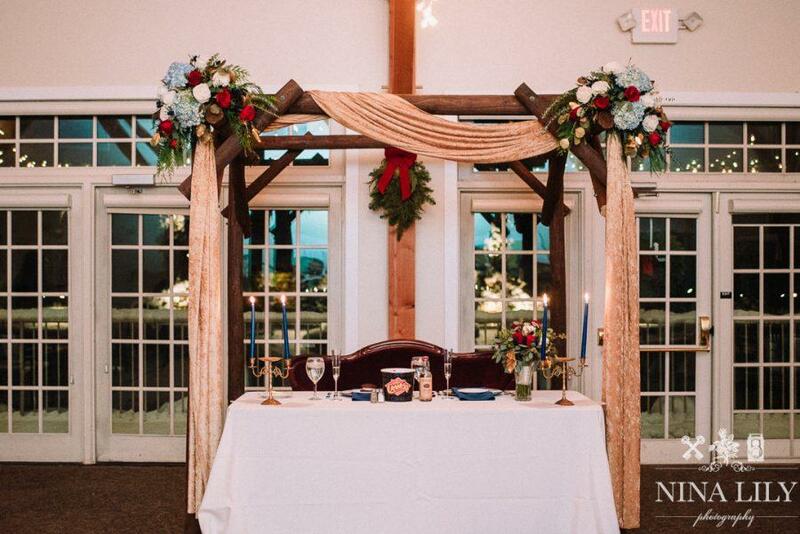 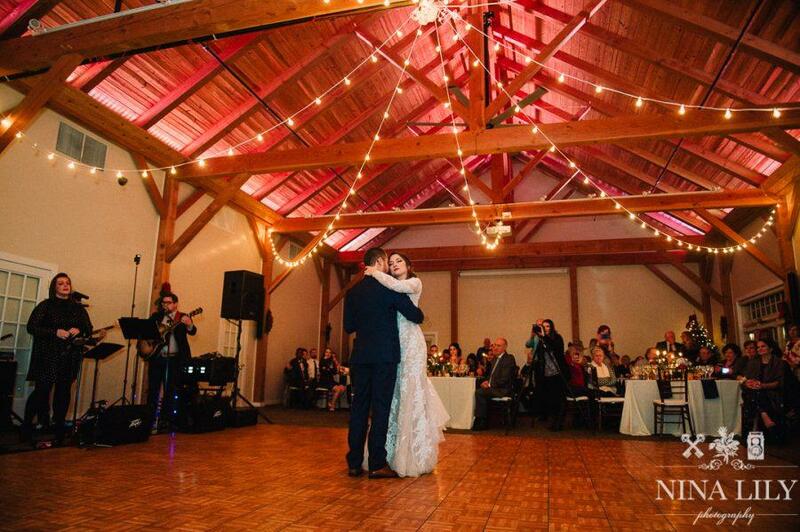 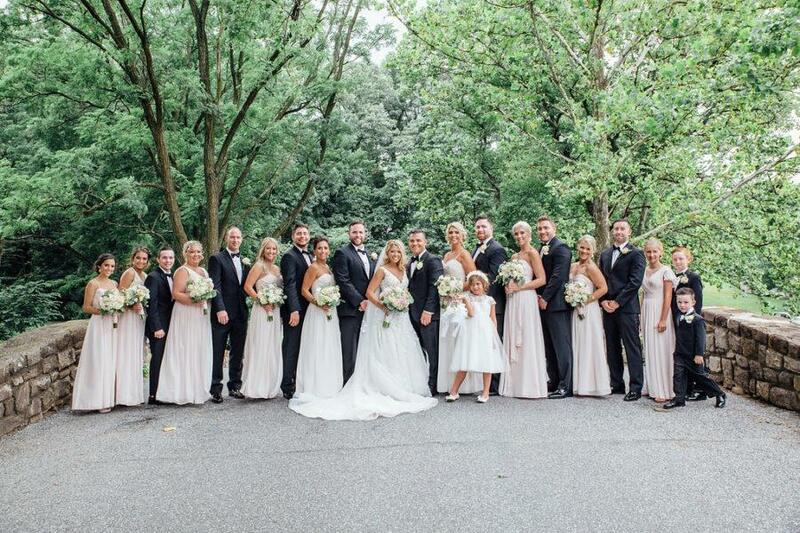 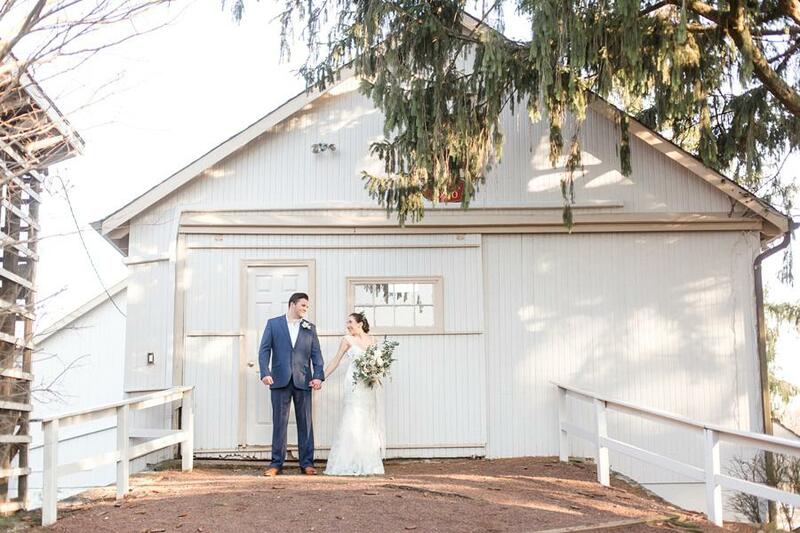 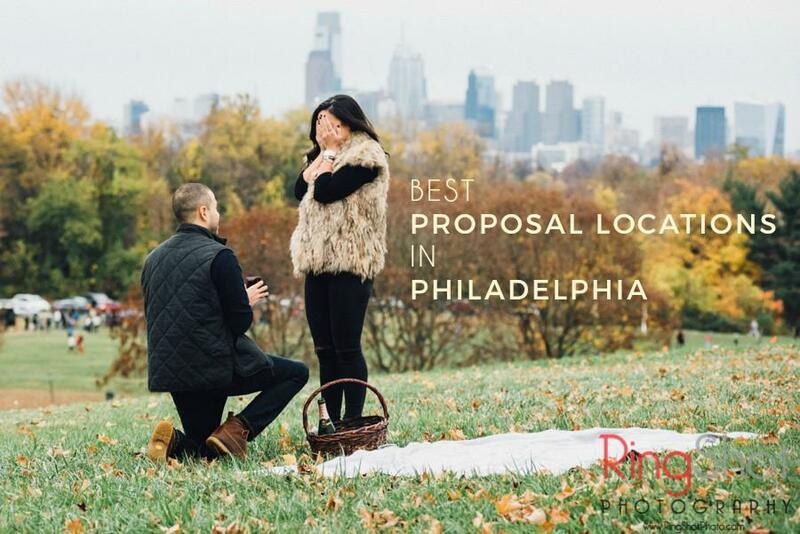 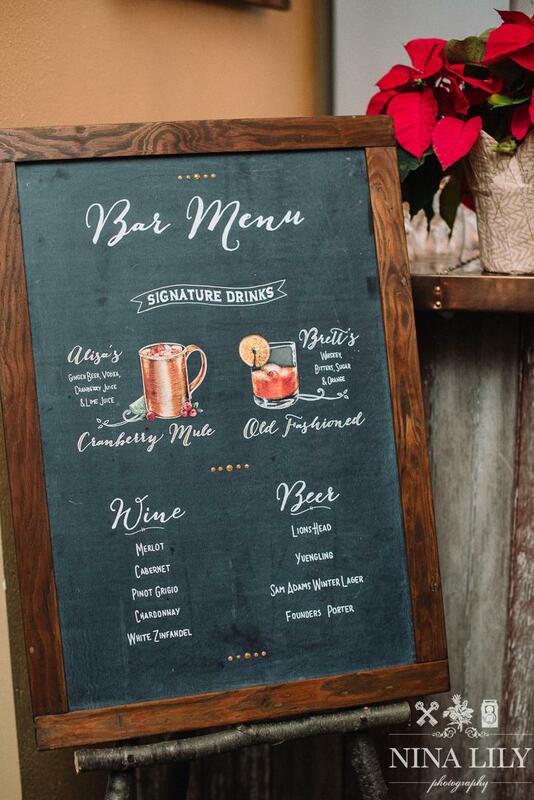 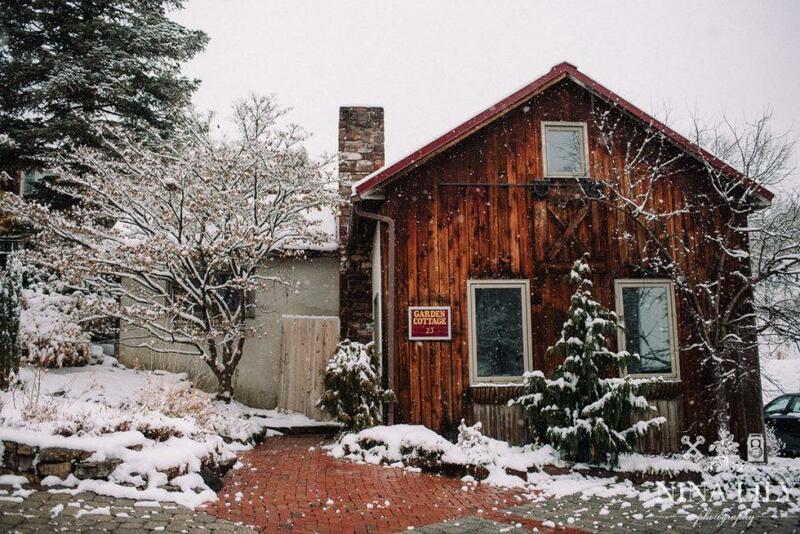 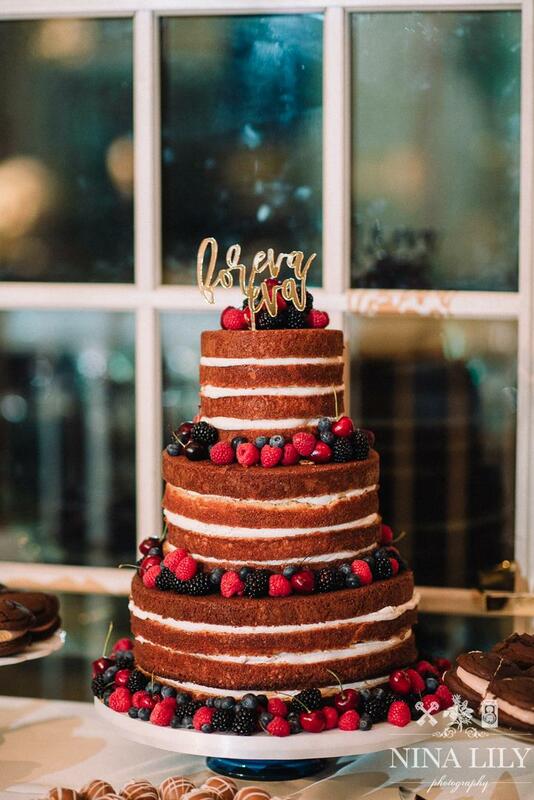 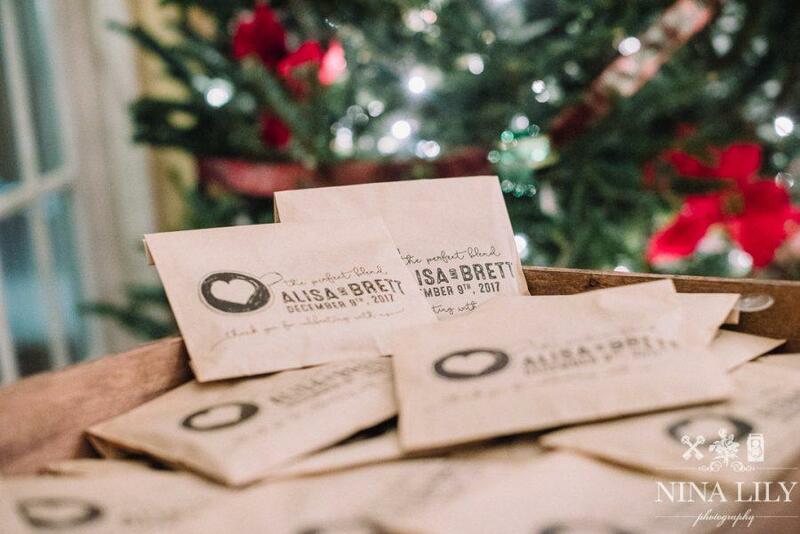 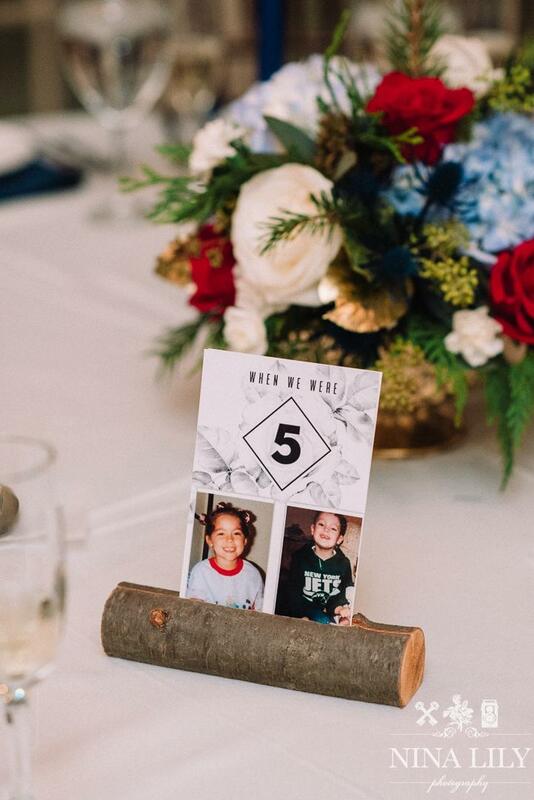 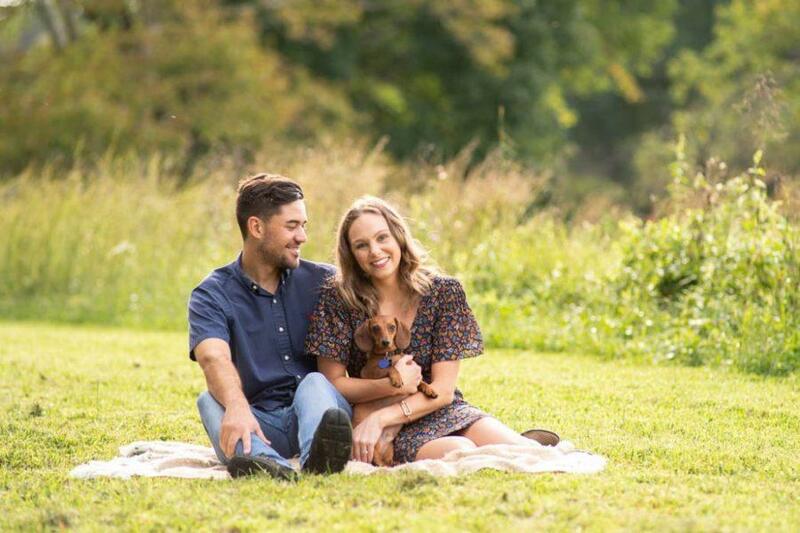 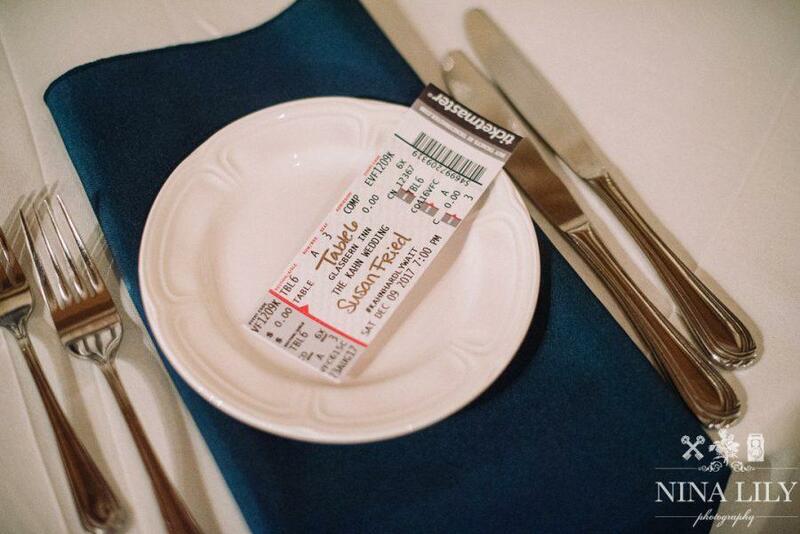 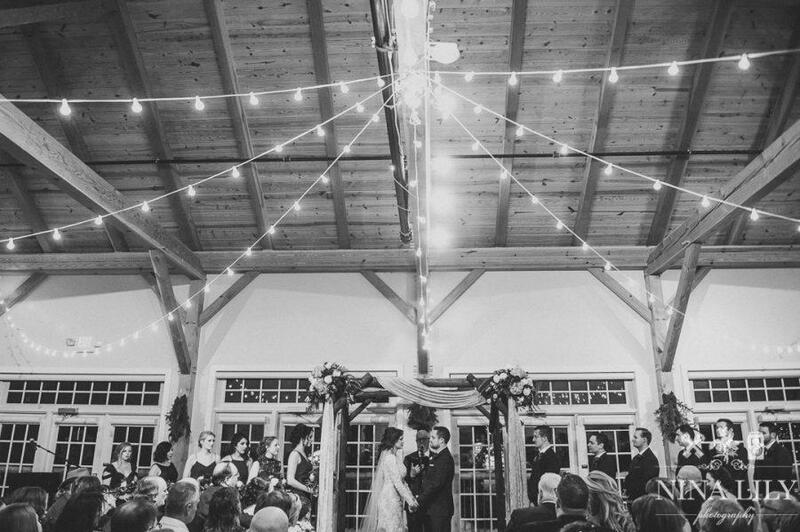 The Glasbern Inn located in Fogelsville, PA ( just an hour outside of Philadelphia) was the perfect location for Brett and Alisha’s rustic event! 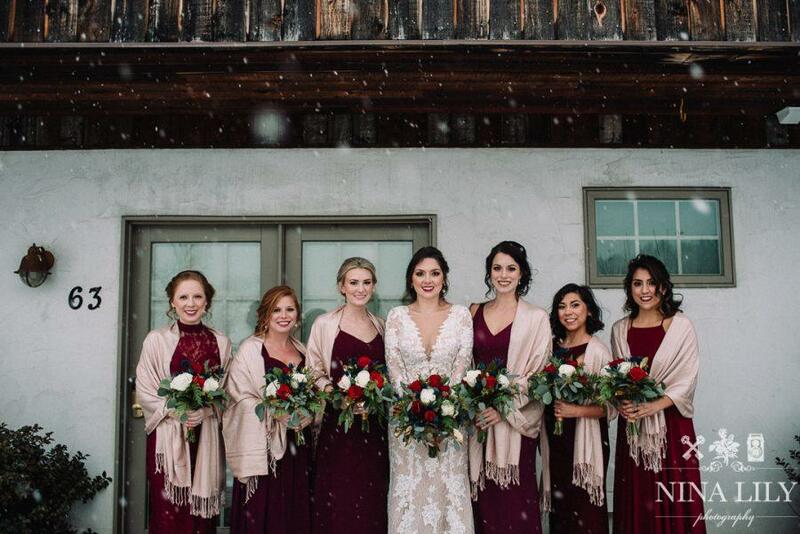 Their chosen color palette of dark reds and blues were an ideal contrast to the crisp snowy white backdrop. 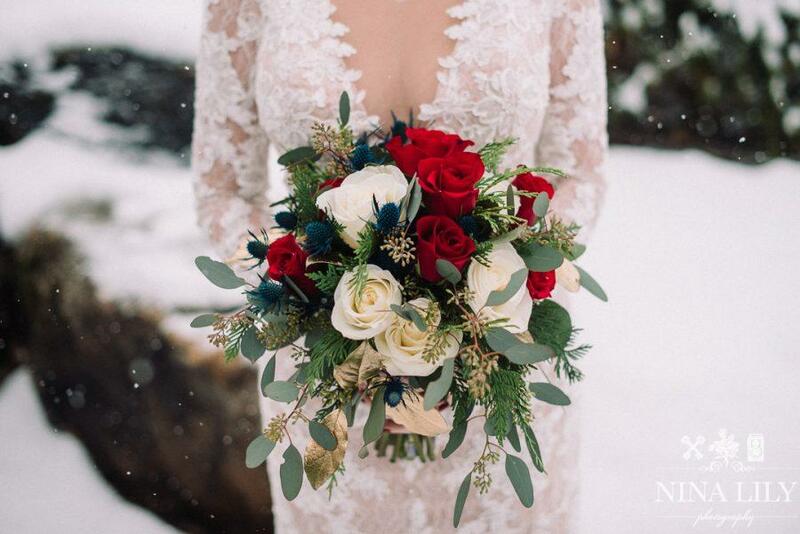 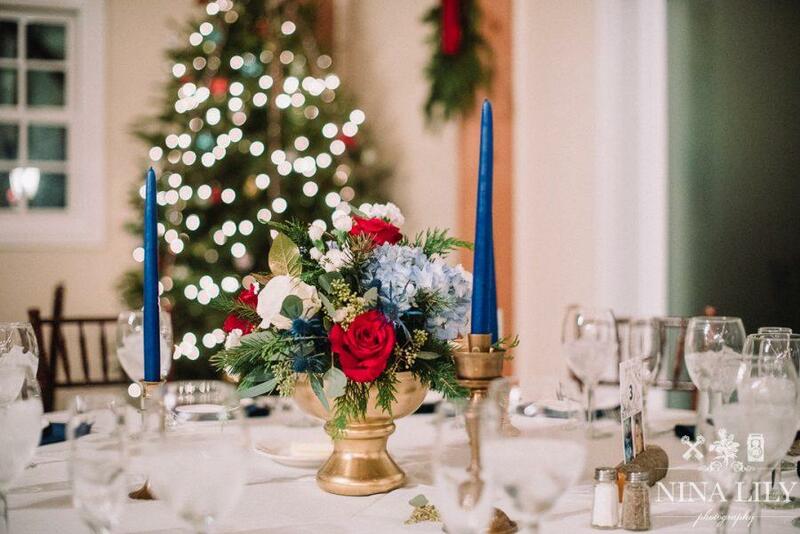 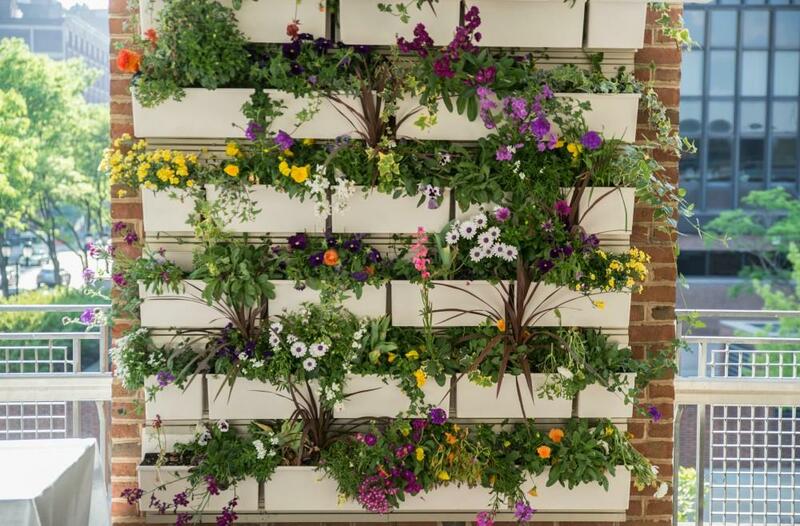 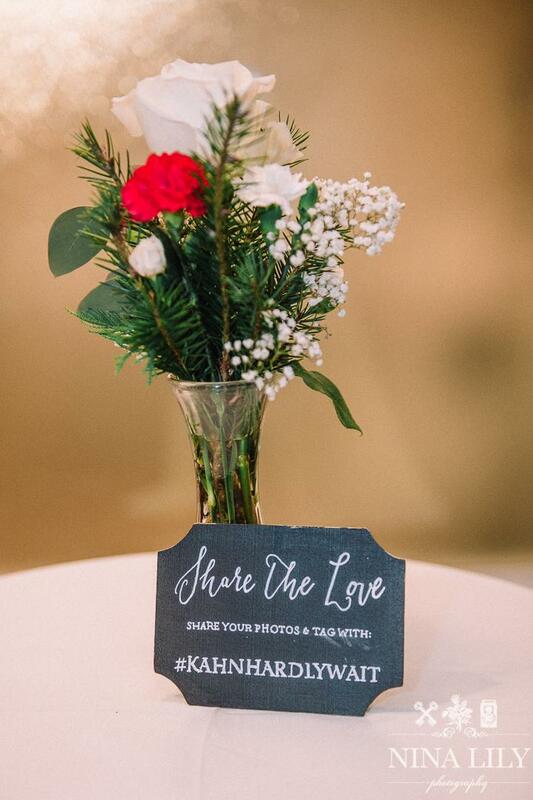 The moody florals designed by Stephanies Greens and Things definitely brought their vision to life! 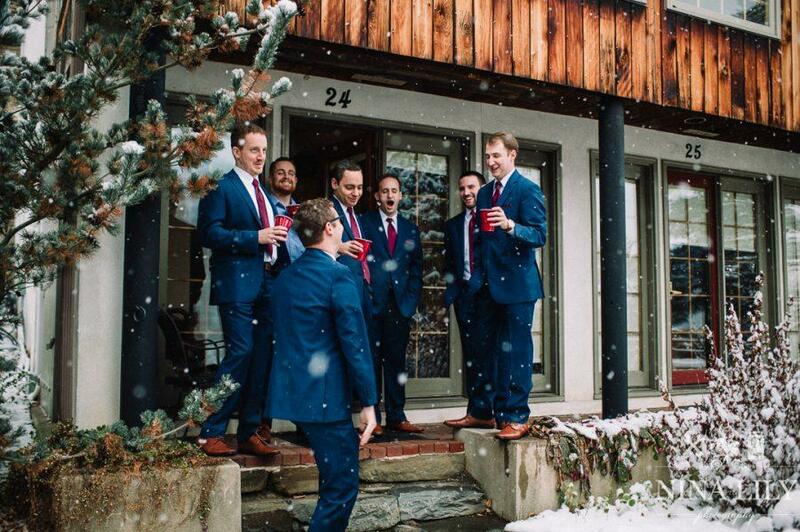 The burgundy bridesmaids dresses and the navy blue groomsmen suits were the perfect complements to the color scheme as well. 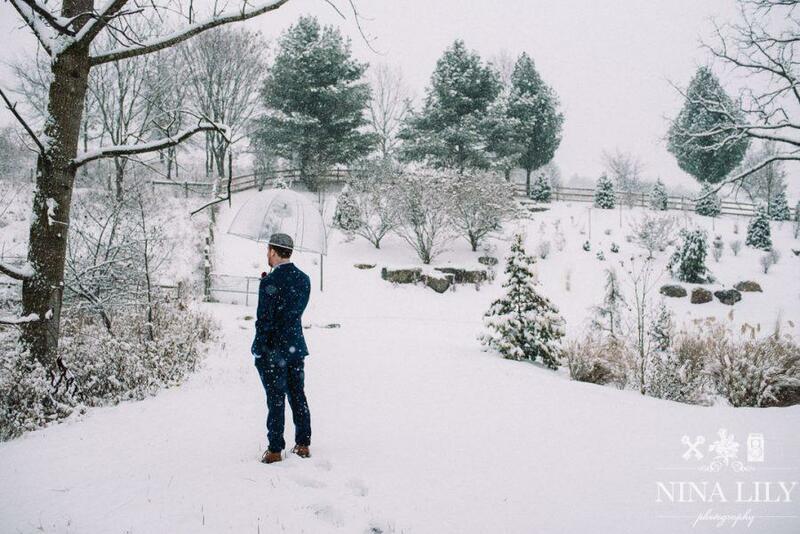 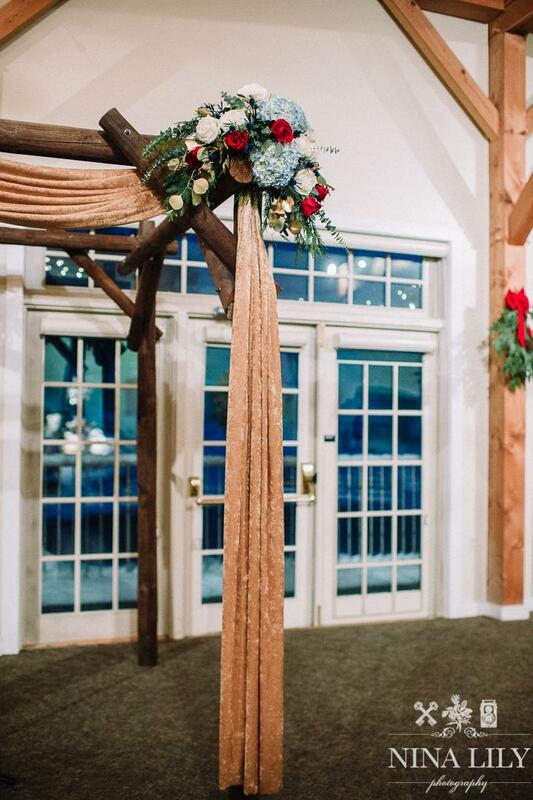 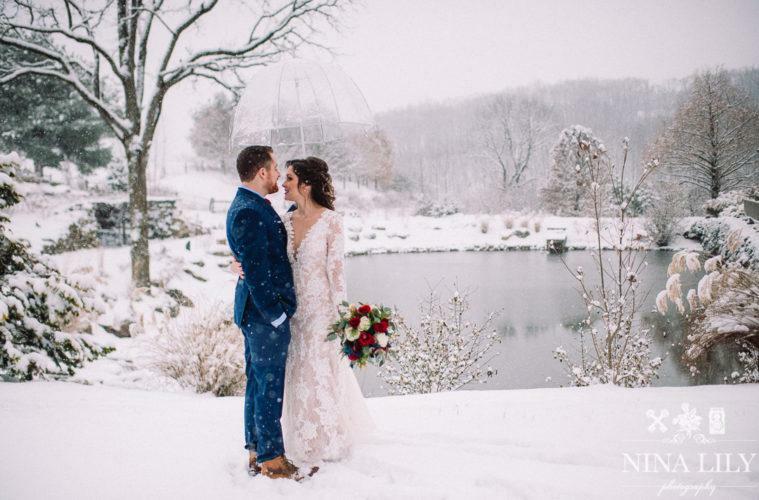 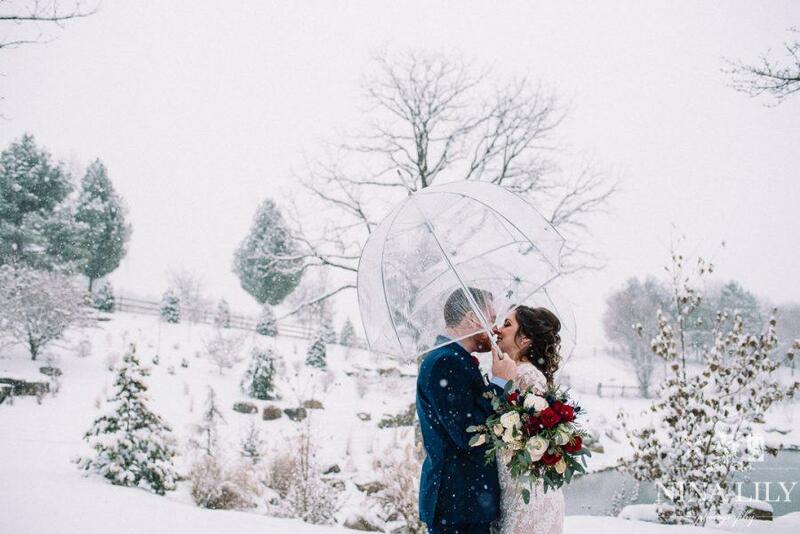 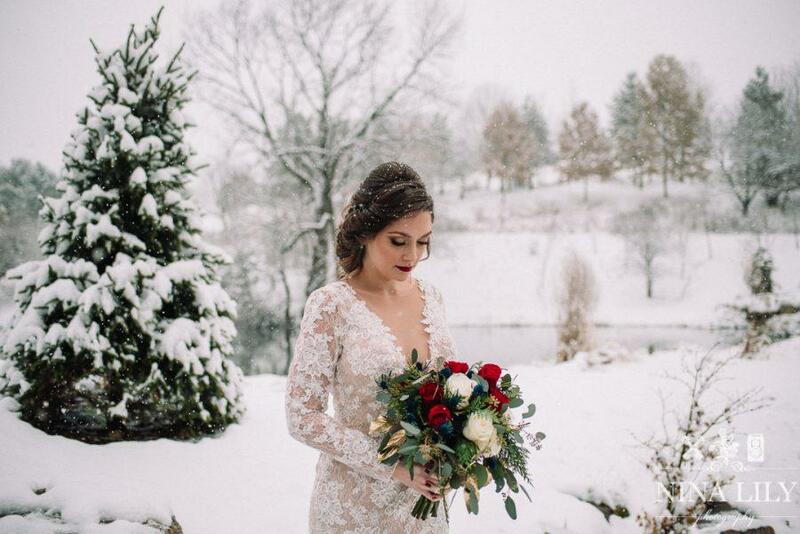 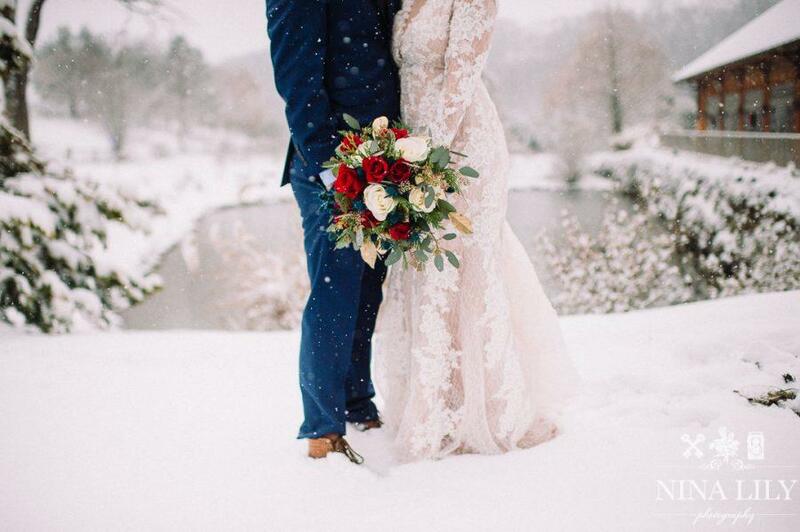 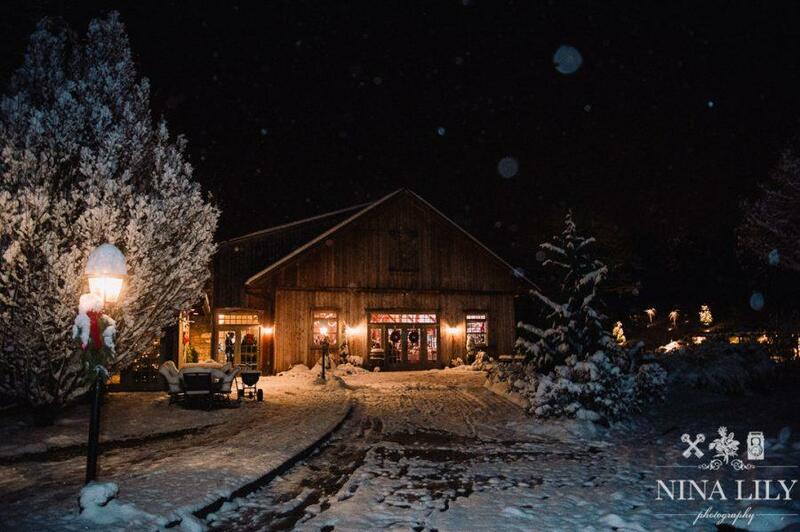 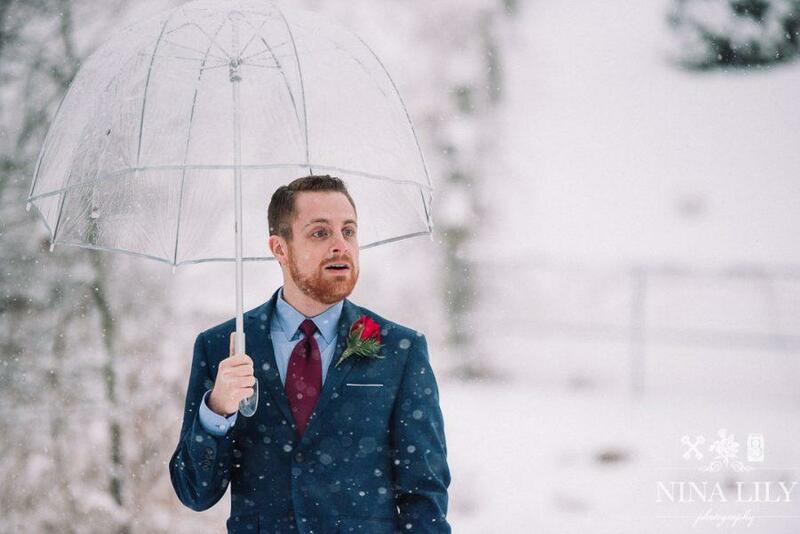 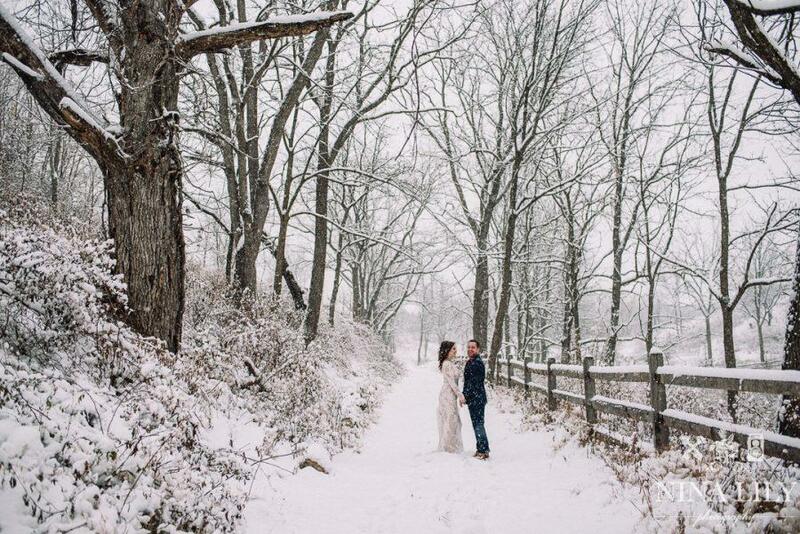 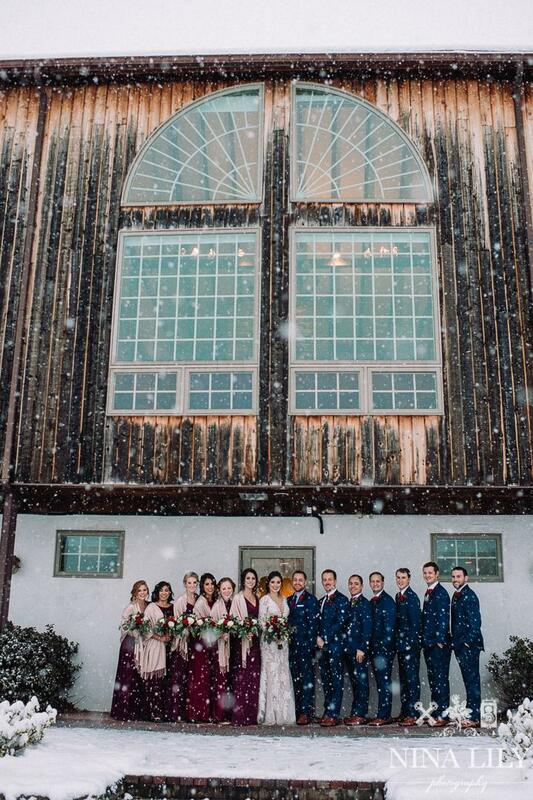 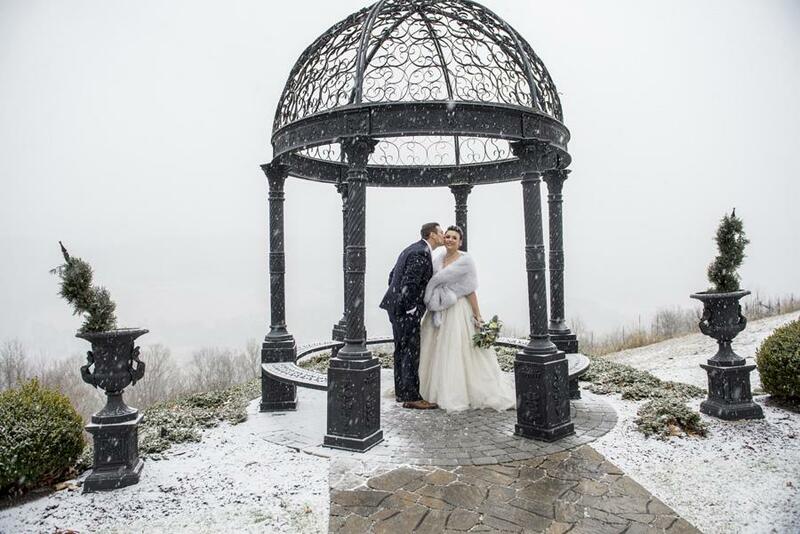 As the couple and their wedding party adventured out into the cold, their photographer Nina Lily Photography captured the snowfall and all its glory! 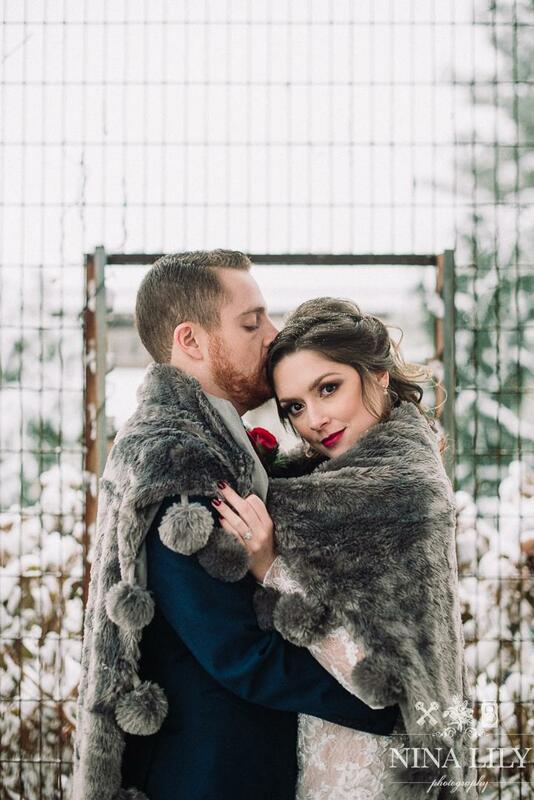 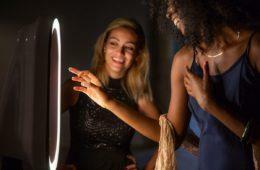 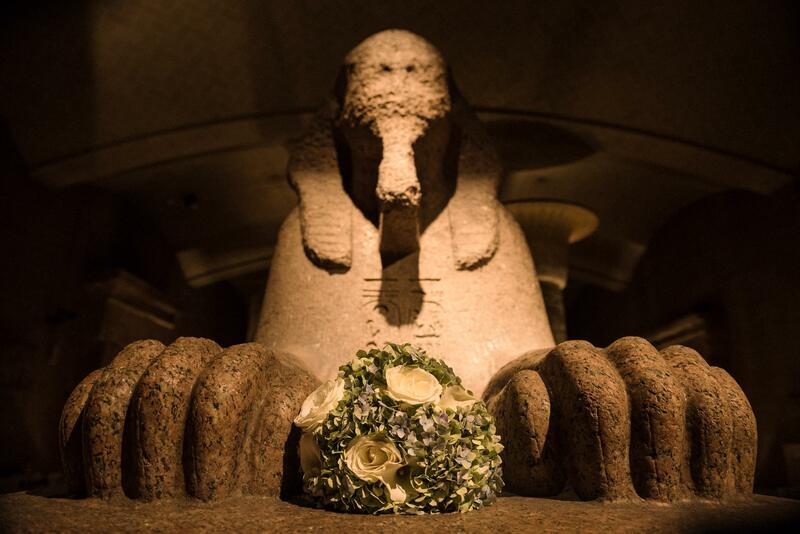 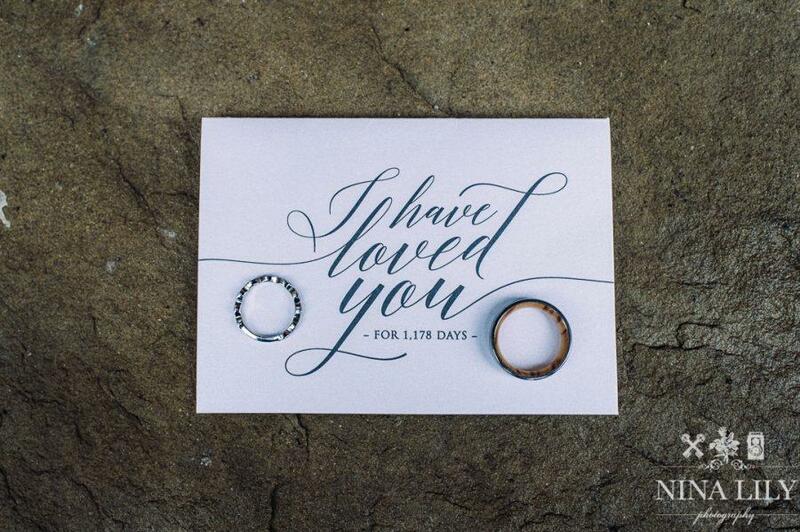 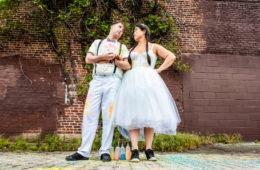 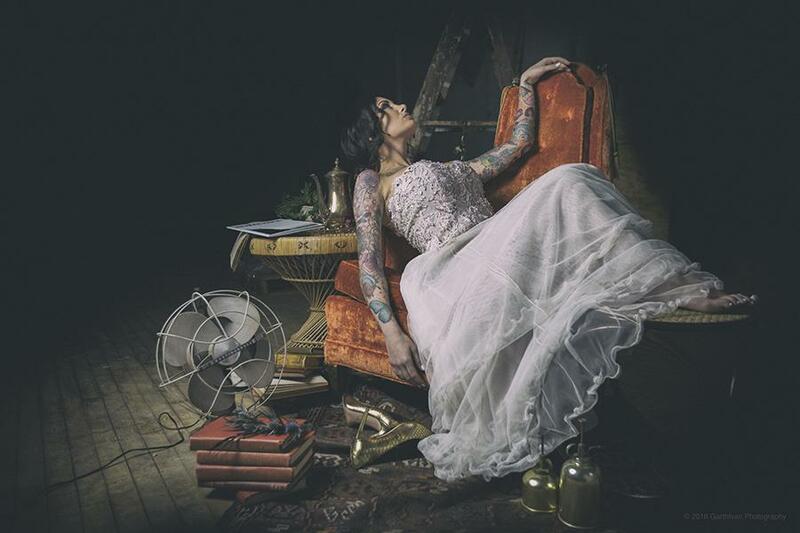 For more loveliness keep scrolling for behind-the-scenes details and the couples wedding planning story. 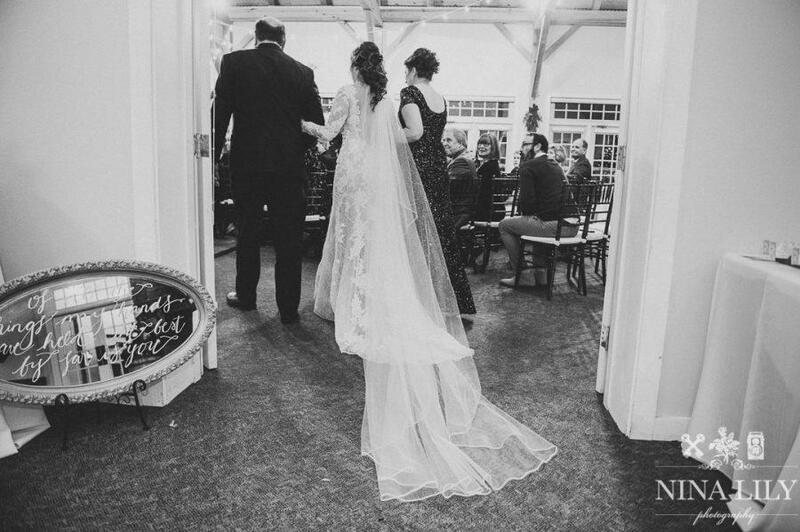 Vendors | Ceremony and Reception Venue: The Glasbern Inn | Florals: Stephanies Greens and Things | Decor: Fox and Finch Vintage Rentals | Canopy: Handmade by bride’s father | Stationery: Honeybliss Design Co. | Dress Shop/Dress Designer: Davids Bridal/Galina Signature | Suits: Mens Wearhouse | Bridal Accessories: Shoes- Badgley Mischka and Earrings- My mothers wedding earrings | Cake/Bakery: Cozze Cakes | DJ/Band: The Bachelor Boys Band | Photographer: Sam Shuma, Nina Lily Photography | Videographer: Joey St. John | Hand-painted Signs: Perfectly Safe Penguin | Hair & Makeup: Alisha Nycole & Co.